Alexandra Cane shows her fans the grim reality of this $5.5k laser facial. 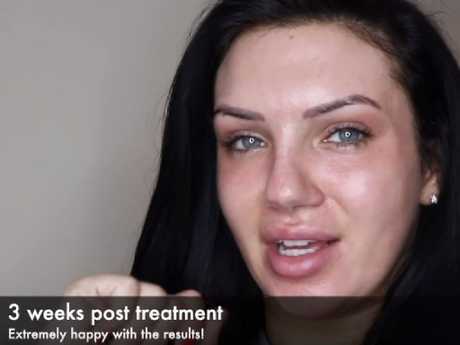 UK reality star Alexandra Cane has proudly shown off the result of her $5500 facial, which left her "half blind" in the process. The 27-year-old Love Island star splashed the staggering amount of cash on a "fully ablative CO2 laser resurfacing" treatment in the UK last month. The extreme facial was performed by Doctor Asif Hussein in a bid to erase scarring left on Cane's face after years of battling impetigo - an infection that results in itchy sores on the skin. But the side effects of the procedure were severe, leaving Cane with a bloodied face and impaired vision in one eye, The Sun reports. Love Island star and model, Alexandra Cane, went to great lengths in the name of beauty. The laser facial is understood to be effective in removing the signs of ageing, as well as scarring and sun damage. But it's rejuvenating effects come at a cost, with patients reporting swollen faces, redness, extreme pain and bleeding in the days following the costly procedure. Patients generally seek out the laser resurfacing treatment to tackle severe issues such as pigmentation, acne scarring and deep wrinkles. Cane's laser facial treatment was carried out in one sitting, as it was deemed a "mild case", and she treated fans to some seriously-confronting photographs and videos during her recovery. The model’s face appears almost burnt by the extreme treatment. 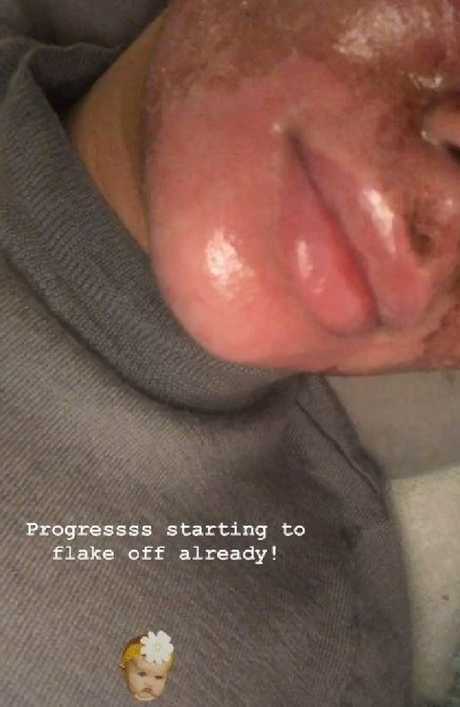 Dr Asif also shared a string of images of his celebrity patient on social media to illustrate the process before and after the expensive facial. The confronting images show Cane's face in the days and weeks after the treatment as it gradually peeled off, bled and scabbed over. The entire process looks seriously painful and Cane told her fans the aftermath was an "extremely sore" experience. Although Cane has fully recovered from the beauty session, she revealed her eyes felt very sore afterwards. In an Instagram video, Cane bared her bloodied face to the camera shortly after the expensive procedure. Speaking in the clip posted last month, she said: "This the current state of skin, it looks quite bloody. "It's starting to scab over now but all is good according to my consultant." Alexandra Cane shows fans the painful results of her laser facial. After this video, things continued to go downhill. Gradually, the photos Cane and her doctor released looked like something out of a horror film, showing the star's skin visibly peeling and bloody. She took to YouTube and social media to document her journey, talking to fans daily about her pain and recovery, as well as posting candid photographs of her face online. By day three, Cane's skin shed from large areas of her face, and a large amount of redness was present. "Hopefully in a few days all of this scabbing should start peeling off," Cane said in another video. "The most sore part is my eyes, but the rest of my skin feels pretty good." While Dr Asif has insisted his patients would heal within five days, the model previously said it would take her five months to completely recover from the swelling and redness. Cane points out the large parts of skin on her face that have peeled off. Cane said her face was sore and swollen after the procedure. "My face was so puffy I could barely see," she said. "I cried because I didn't realise how swollen my face would be." However, by day four, the redness on Cane's face had largely reduced. Later photographs posted online show the Love Island star's skin three weeks post-treatment looking radiant and renewed. The facial’s extreme side effects calmed down after several weeks. In a post to his Instagram account, Dr Asif said Cane's face was an example of "how quickly (skin) can self heal in just 5 days". 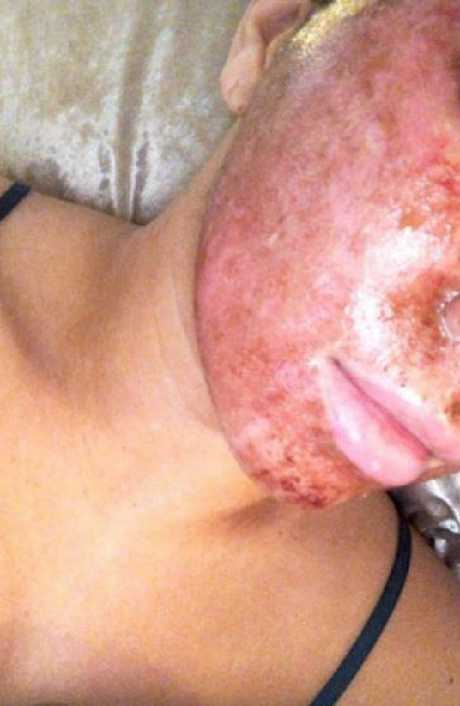 "(Alexandra) was a very mild case, and although the final result reveals an impeccably flawless skin surface, more dramatic results will be seen in patients with more severe concerns," he said. Dr Asif continued, claiming fully ablative CO2 laser resurfacing treatment is used to target "the most extreme cases of acne scarring, pigmentation types, and deep wrinkles". "It is by far the most powerful skin rejuvenation technique available on the market," he said. Alexandra Cane posted photos and updates to social media afterwards. Cane showed off her red, swollen face on her Youtube channel after the facial. Was it worth all of that pain, Alexandra?